Thanks to my contributors, I will not be writing all of this issue myself. My pleas for copy have been answered. Nevertheless, I have just returned from a long interesting vacation in Europe which has provided plenty of topics of possible interest. Although they will read a bit like a travelogue, or “what I did on my vacation,” there are some things among them which I hope will be of interest to members. Please note that on Saturday, Jan 23, 2016 from 10-12:30am we will screen the film about Lutah Marie Riggs Film (2014) and have some discussion. Architect Lutah Marie Riggs, (1896-1984), was educated at UC Berkeley and practiced in Santa Barbara. 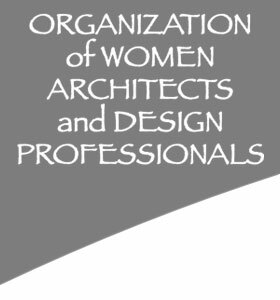 This is an award winning 65 minute film called "A Passion for Architecture: A Life of Design" by the Lutah Marie Riggs Society http://Lutah.org. Mui Ho and the late OWA member Nancy Florence visited Ms. Riggs in 1982. Mui will start the discussion that will continue into our concerns about architecture today. Location: 1605 Arch Street Berkeley off Cedar Street. Fresh fruit, scones and morning buns from the Cheese Board will be available with coffee or tea. City Slicker Farms, a pioneer of food-producing gardens in Oakland’s low-income communities, is wrapping up construction on a new permanent farm and park for West Oakland. A milestone for food justice and land ownership in a challenged community, the long-awaited project will turn 1.4 acres of formerly industrial property into a thriving green space and working farm for the neighborhood. City Slicker Farms owns the land where the farm and park are sited. Located in the heart of West Oakland at 28th and Peralta Streets, this will be City Slicker Farms’ largest farm site, doubling the organization’s capacity to distribute food and educate community members about urban farming and gardening. The design process was highly collaborative. Lowney Architecture and CMG Landscape Architecture worked closely with City Slicker Farms staff on the design. Furthermore, several community meetings encouraged the local community's involvement in the design process. This ensured that their needs would be met and that they would have a strong sense of ownership of the project when complete. The “West Oakland Urban Farm and Park” will feature new open green space with host of new recreational and educational opportunities. 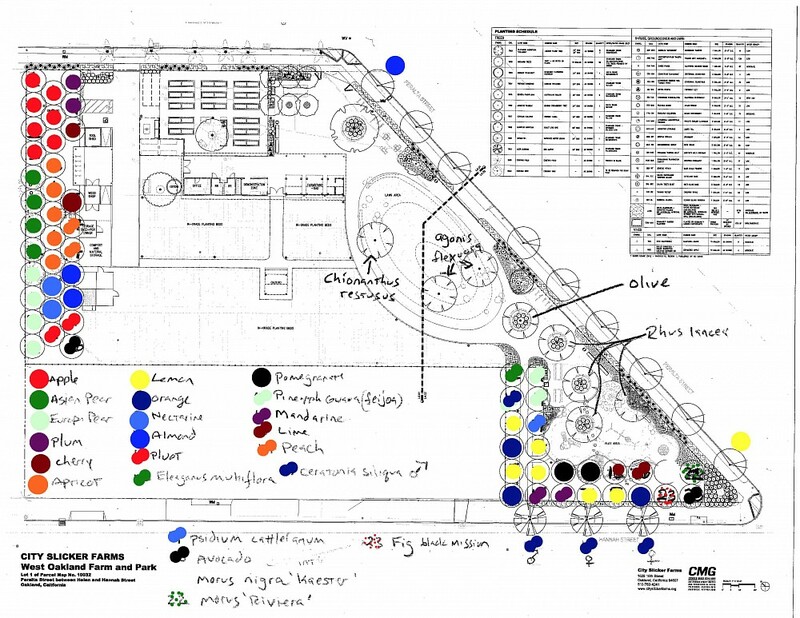 The community-driven design includes a children’s playground, a working farm, open space (to provide room for youth of all ages to run, play, and exercise), a community garden, a fruit orchard, a chicken coop, public art installations and a beehive. The park will be open seven days a week, from morning until night, without charge. City Slicker Farms is collaborating with other community-based groups and individuals to provide ongoing outdoor and educational programming for the community at the site. Food grown on the farm will be available for purchase on a sliding scale basis to community members at a weekly farmstand. In 2010, City Slicker Farms was awarded $4,000,000 for a “West Oakland Park and Urban Farm” project. The funds come from Proposition 84, a California bond initiative approved in 2006, which reserves 5.4 billion dollars in bonds for projects involving water quality and access, park improvements, and natural resources and park preservation. The “West Oakland Urban Farm and Park” was the second highest award in Alameda County and the 22nd largest award in the state. 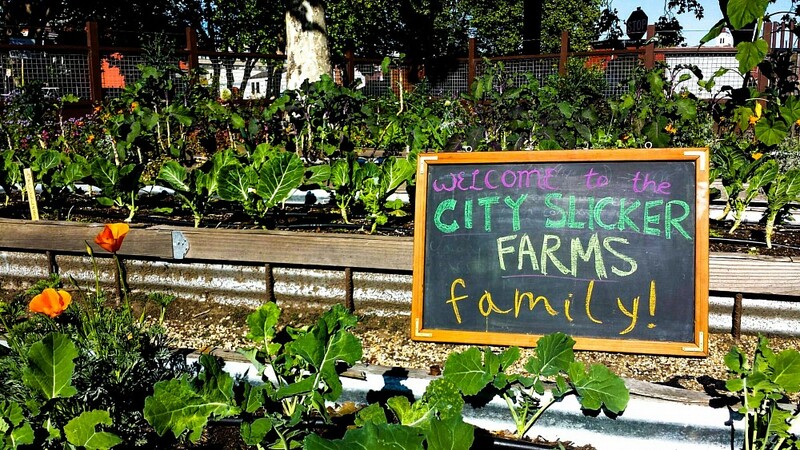 Since 2001, City Slicker Farms has been successfully partnering with thousands of West Oakland residents to transform vacant lots and hundreds of backyards into food-producing gardens, growing over 25,000 pounds of food each year. This exemplifies a successful, resident-driven movement to utilize urban agriculture as a means to get needed food on the table. West Oakland is an 8.2 square mile industrial area bounded by three major freeways, and it is home to the 5th busiest port in the country. The neighborhood struggles with poverty, environmental pollution, and a lack of access to fresh, affordable healthy food. Thirty-two percent of residents live below the poverty level, and mortality rates for diabetes and heart disease are 1.5 times above the county rate. The lack of access to safe open space and healthy foods contributes to chronic illnesses. This new project will address these issues in a greater capacity by more than doubling City Slicker Farms’ operations and programs. This project has truly been a team effort. Many local professionals worked behind the scenes to bring this impressive project to fruition. Local firms Lowney Architecture, IDA Structural Engineering, Sustainable Urban Neighborhoods and John Raeber donated their professional services. Several other firms offered their services at reduced fees. Architecture students from CCA (California College of Arts) designed and will build the planned chicken coop. They all believe in the promise of Oakland and support its development along a path that includes and benefits all residents. Photo of one of the current location of CSF. Photo by ??? City Slicker Farms supports food self-sufficiency by creating organic, sustainable, high-yield urban farms and partnering with residents and institutions to transform outdoor spaces and yards into food-producing gardens. These spaces provide healthy, affordable food and improve the environment. City Slicker Farms prioritizes people who have the least access to healthy food. The farms and gardens demonstrate the viability of a local food-production system; serve as community space; empower children and adults who want to learn about the connections between ecology, farming and the urban environment; and support tools for self-reliance and empowerment. It's not too late to contribute! Community build days are coming up, and if you prefer not to swing a hammer, please consider donating funds. The day following the OWA Annual Meeting, which was held in my living room on October 20, I leave for Europe, where my vacation begins with a ten days’ visit in with friends in Kralupy na Vlatava, (“Kralupy on the river Vlatava,” known as the Moldow in German) a small town Northwest of Prague. This hospitable family is composed of Lenka Capekova, Jaroslav Capek, their four year old child, Eduard, and an hyperactive German schnauzer named Fussey. Lenka’s mother Ivana died last winter. She was a good friend, and had such a powerful personality, it is hard to believe she is gone! She used to be my enthusiastic tour guide for architectural gems of the Czech Republic. However, Lenka and Yarda seem happy to take over her role as guide. It seems a nice diversion for them, and as always, they have planned tours of interesting castles and constructions in North and East Bohemia. Lenka is an attorney who specializes in criminal law. Jaroslav (Jarda) is a civil engineer and contractor. He loves to cook and enjoys music. We always end up talking shop, so I learn about renovating old stone and masonry buildings and the woes of getting approvals. Eduard (Edu) is a precocious four year old, larger than his age group, mischievous and a bit spoiled. He has a definite technical bent, and is always examining machinery to see how it works, and “cooking” things (inedible things) while his father makes dinner. Lenka has a grown-up son by a previous marriage, named Marek. Edu likes him, it is clear, but isn’t sure who he is. The smallish country town of Kralupy na Vlatava was badly bombed in World War II, and many of its older buildings were in need of extensive repair and rebuilding, affordable and perfect projects for a Contractor/Engineer like my host! Jarda bought half of a group of Farm buildings, and part of a terraced orchard. He has done a lot to the house, making it comfortable, adding a winter garden, and building it a garage. An adjacent wing is unfinished, and would be a place for his mother, or Lenka's father if either were in need of a place to live. Between the small rural villages the rolling farmland extends in large uninterrupted swaths which my hosts say is the result of collectivization during the Communist era. It is now more efficient to farm, so no one seems to want to restore the old boundaries. This character is really obvious from a plane, and contrasts with Bavaria where the old land divisions are still in place. However, the inefficient old road system appears to be unchanged in Central Bohemia, with the exception of the addition of roundabouts which make the many small intersections much safer. Roads still go through the middle of towns, and wander along old boundaries with fruit and nut trees on both sides. Although I have been a passenger many times while traveling through this countryside to get from Krallupy to Prague (30 minutes away), I would need a GPS and a lot of luck to find my way alone! On the first Saturday of my visit in the Czech Republic, when the whole family can join us, we drive to Liberec in Northern Bohemia to visit Grabstejn Castle, the remote outpost of a noble German family. When Germany lost the last war, Czechs of German descent were summarily dispossessed of their Czech properties. One assumes that is why this estate now belongs to the State. The day is magnificent; warm and sunny. We have a tour of the cold, rambling castle, where hunting seems to have been the primary pastime. It is clear from the paintings of the impressive family tree (adorned with many different colorful escutcheons) and from the many family portraits, that having to maintain the family dignity by finding suitable aristocratic mates for their abundant children must have been a full time job. The current scion has married out of the nobility, and so has lost status in the family, a point our guide is careful to make. Although the palace is owned by the state, family members do visit from time to time. They apparently still own other castles in Germany. We end the afternoon at Ještěd (Czech pronunciation: [ˈjɛʃcɛt]; German: Jeschken). It is the highest mountain peak (1,012 m) of the Ještěd-Kozákov Ridge near Liberec. From the summit there are views into Germany and Poland. The Horní Hanychov region of Liberec lies just below the mountain. 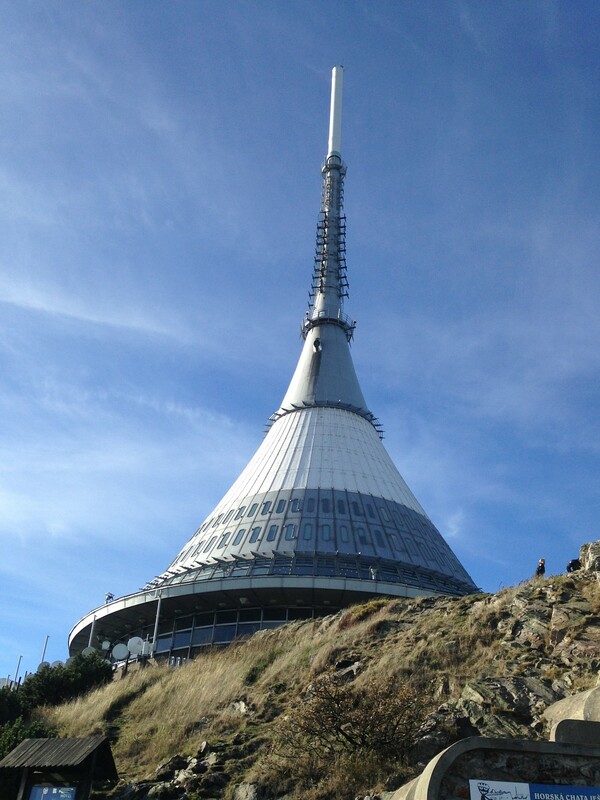 On top of the peak is the Ještěd Tower restaurant, hotel and television tower, designed by Karel Hubáček who won a competition for the commission. The mountain also has a ski resort. Its predecessor on that site was destroyed by fire in 1963. The current tower, begun in 1966, is a tapering cone (actually a rotational hyperboloid) built of reinforced concrete, sitting on piers atop a conical hill which is ominously shaped like a cinder cone. The structural engineer was Zdeněk Patrman and the interior was designed by Otakar Binar, who made extensive use of glass Hubacek received an international award, the August Perret Award, in 1969 for the design. There were some dramatic moments once it was completed, when the building swayed in the strong winds which threatened to destroy the tower. The team resolved this awkward difficulty by adding a 1300 pound ballast weight and a vibration damper. This seemed to fix the problem since Ještěd still stands proudly to the present day. The tower was opened with great ceremony on the 21st of September 1973. It is 308 feet from the foot to the tip of the antenna and it was designed to withstand the truly extreme climatic conditions at the top. On the lower of the two floors there is the machine-room, technical equipment and operations room. Above these there is a look-out terrace, a buffet, a restaurant with cafe and a hotel. The upper part houses the communications equipment. The top contains a tubular construction on which is mounted a 56 foot-long antenna. There is access by car, but it is more easily and pleasantly reached by a funicular from the base of the mountain. A pair of opposing ramps lead one to the Hotel lobby. From there, a beautiful stair brings one to the third floor above grade where there is a restaurant in perfect original 1960’s condition. The large but rather narrow curving dining room has canted strip windows facing the view, with concentric rows of furniture, light fixtures, railings, and the dramatic curving stair which wraps an inside stone clad wall decorated with large cast glass sculptures. North Bohemia used to be famous for its glass and production, which now, alas, is fairly limited. Jested is a popular destination on weekends, even this late in the season, which is cold, but still without snow. In winter one can ski here. We join the line on the stair for the restaurant and eventually get a table on the west side, where we have hot chocolate, coffee and we order “pine cones” (shiska) which I am told are a typically Czech pastry. The pine cones turn out to be sweetened potato dumplings covered with powdered sugar, butter and ground poppy seeds, and are both starchy, heavy and rich, but quite delicious. The ground poppy seeds give them a curious, distantly familiar flavor, as though I might have tasted something like them in my childhood, perhaps with my Slavic relatives. From the seating area one can see the countryside far below, through wispy clouds and mists which are occasionally punctuated by small airplanes looking like remote controlled toys. This dramatic spot seems a favorite small plane destination. After exploring the viewing terrace, admiring the silly sculpture of a dwarf, and taking hero shots on the higher of the rock outcrops, we take the funicular back down the mountain, and return to Kralupy. 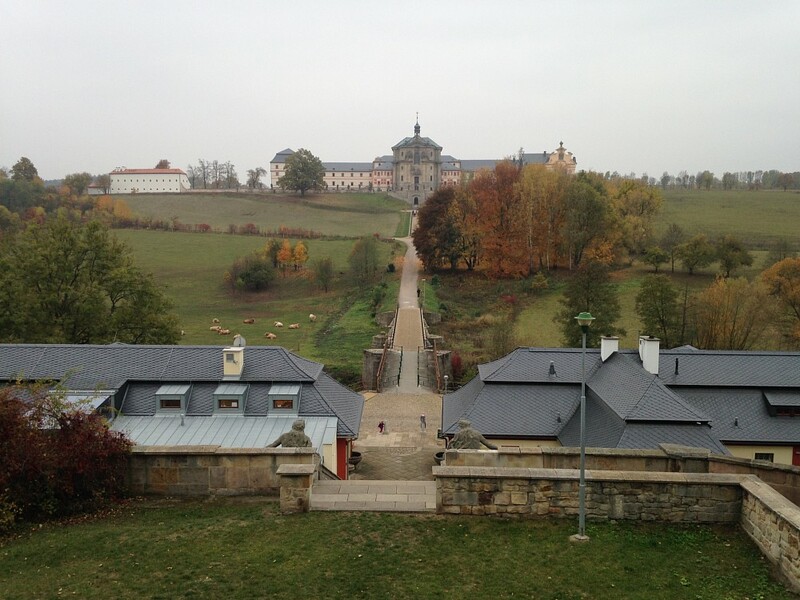 On a cloudy day in late October, my last day in the Czech Republic, Lenka Capekova and I drive to East Bohemia, to a small village near Prasky Hrad, called Kuks. It is a former spa town, with an 18th Century hospital. Most of the original complex is missing, but what remains is now almost completely restored. 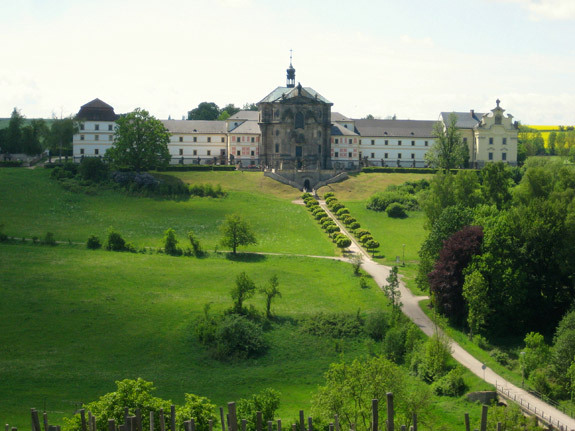 It is still only a fragment of a much larger complex, built by its founder, a fascinating minor German nobleman and art patron named Franz Anton von Sporck. Sporck’s father had been ennobled for his service in the Thirty Years War, and for fighting against the Turks. 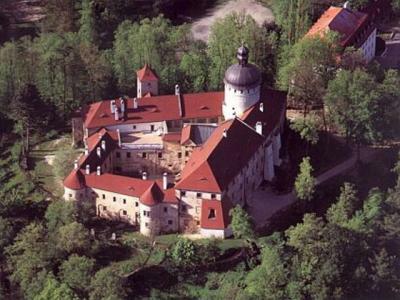 He was rewarded with an estate in Bohemia and had purchased this site along the Labe in 1662 when he was 65. Franz Anton was born there that same year, and inherited all his father’s estate when he was 17. A well-educated and cultured man, Franz Anton seems to have been somewhat insecure in his recent nobility, and somewhat conflicted. He traveled around Europe, spending much time in the court of Louis XIV who was building Versailles at the time. He determined to build something on that scale in Bohemia which would impress the more seasoned nobles, whom Franz Anton nevertheless apparently despised. 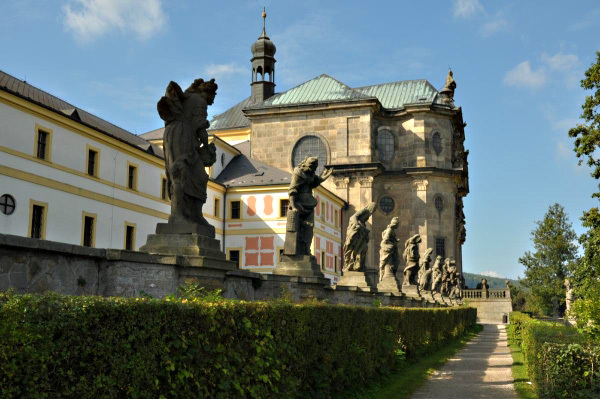 He discovered a mineral spring on his land beside the Labe River, near Hradec Kralove, and in the thirty years from 1694 to 1724 he built a deluxe spa complex, complete with baths, infirmary, chapel, racecourse, theater, gardens, guest houses and a new mansion for himself. The chapel and perhaps the mansion were designed by the Italian born G.B. Aliprandi, who at the time was an architect in great demand in Prague. Franz Anton was a complex personality, with some major contradictory impulses. There seems to have been a powerful moral and religious component (Franz Anton had had a Jesuit education), especially present in the magnificent chapel, and the didactic and religious sculpture he commissioned, but that was balanced by an equally strong intellectual and luxurious sensibility which provided the rich entertainments and lavish accommodations. The site was richly decorated with large sculptures, many of which still survive. 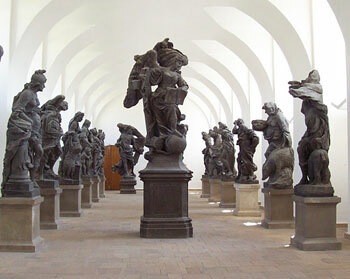 By far the finest were those by a famous Tyrolean sculptor named Matthias Bernard Braun. 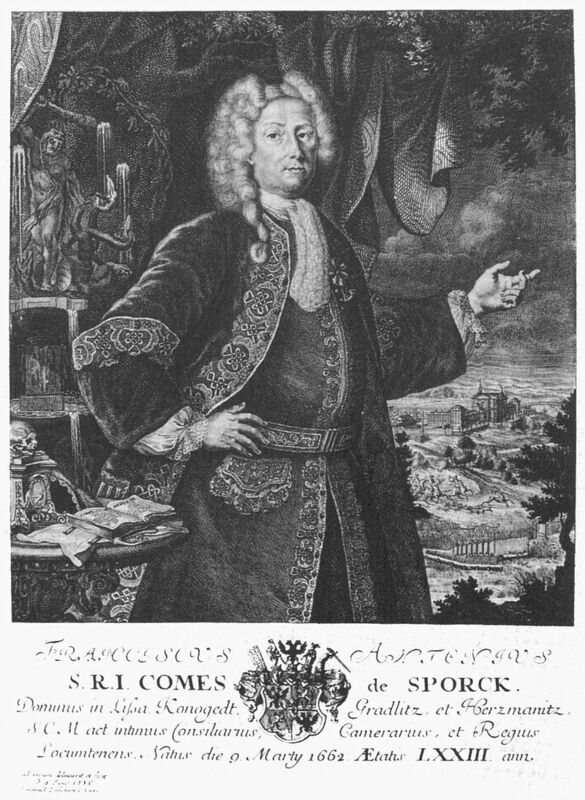 Sporck was one of his first Czech patrons. The only earlier one was the group of St. Luitgard for the Charles Bridge in Prague. But Sporck may have gotten him that commission. Once completed, the complex provided entertainment and comfort for the rich and talented. During that period Kuks, with its concerts, salons, hunts and lavish parties at this upper-.class Baroque resort gave competition to the famous spa towns of Western Bohemia, Kolovy Vary (Karlsbad) and Marianske Lasne (Marianbad). During Sporck’s lifetime it was certainly the social and cultural center he intended it to be. There were fairs in which wine was dispensed from wells, hunting parties that included royalty, knighthood ceremonies for a hunting order Sporck (the Knights of St. Hubert; of which the Emperor was a member), and Venetian nights on the river with music and cannon salvoes. However, only 20 years after it was finished, and two years after the death of Sporck, a terrible flood on the Labe permanently destroyed the healing spring which fed the spa, and swept away three bridges, the race track, the Summer Pavillion, and assorted other buildings. Thereafter the site went into decline and over the years most of the remaining structures were pillaged for building materials. The hospital, its chapel and a couple of spa buildings, a grand stair and some worker housing are all that remains. Sporck’s mansion was the last to be pulled down, which happened in 1901. Tom and I visited Kuks in 1993, and saw what remains of it in its original disrepair. I am glad to see it now renovated and restored. Even with the missing buildings, there is more than a hint of the magnificence of the original complex with its grand North-South axial layout. From North to South, it crosses the Labe River valley. Sporck’s mansion and hot spring with spa buildings were on the slope above the North side. A grand stair bordered by cascades down either side led from the site of the mansion (which was on axis with the hospital and chapel), passes a hotel and assembly rooms (one of them now housing a restaurant). Below that is the river. The Axis continues across an old bridge, and passes through fields dotted with picturesque cows, and random statuary borders the path as it climbs up the opposite hill, where a double stair leads up to a large terrace lined with statuary to the chapel and the hospital beyond it. Copies of Braun’s magnificent larger-than-life baroque statuary of the Vices and Virtues on the hospital terrace. The originals have been moved to the hospital dining room where one can enjoy their remarkable dramatic power and wonderful movement of these allegorical tours de force. The various vices and virtues are all personified beautifully. One has to believe that some of the ailments treated in the hospital might have been avoided had people seen the allegorical statues BEFORE they got infected. 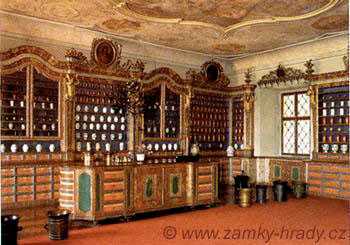 The tour includes a visit to the famous pharmacy, which still has its original decorated ceramic jars (labeled) and even turned wooden boxes which we are told are quite rare. These are set out on beautifully decorated cabinets and shelving. We see also the large elegant chapel of the hospital, where we are treated to a concert by a pair of Renaissance musicians playing various period instruments and singing in Czech medieval and Renaissance songs. They play various winds, strings, percussion, a tiny organ, cow horn flutes, a primitive zither-like thing, bag pipes, in addition to singing beautifully. Quite impressive. I buy a disk. Our complete tour ends with a tour of the crypt of the hospital founder and his family. Only four of us have opted to see this last part of the tour, a cold, dark domed space under the chapel where ancient decaying wood coffins and catafalques have been faithfully preserved without repairs, or even dusting. Indirect light sources high up in the dome provide only a dim light, augmented by those of us with flashlights. A small window on axis allows a view into the crypt, so we are often aware of silhouetted forms of people peering down at us. A visit to this spooky place is perfect for today, which happens to be Halloween! We observe that the remaining site organization reflects the progress of the patients, and their illnesses. First, one took the cure at the spa. Second, if the cure failed, one moved to the infirmary on the hill across from the spa, gently lectured to by the virtues and vices. The impressive chapel encourages repentance and offers comfort. Behind the hospital patients can enjoy the formal garden. which also provides fresh vegetables. Third, for those who don’t respond to treatment, beyond the garden is a graveyard. The entire process, from taking the waters to reposing peacefully in the ground, is laid out before us! The original included an area we don’t have time or energy to see, “The New Grove at Zirec” which had some amazing large biblical sculptures, many carved in live rock, the last works done at Kuks by Braun. I remember seeing them with Tom, but by the time Lenka and I have finished our late lunch, it is getting dark, and cold, so we decide to leave. Lenka’s charming older son Marek, who is 20 years older than his half-brother Edu, works for the Czech President’s office in public relations. He has planned two visits for us to two publicly-owned Presidential villas which are sometimes open to the public. On special days when the public is allowed to visit them, Marek has made us reservations to get in early due to his privileged status, helping us to avoid the crowds. On Sunday we have the first of the Presidential villa visits. We go Sezimovo Usti with Janek and his girlfriend Catherine to see the villa of Hana and Edvard Benes. Benes was the second Czechoslovak president. He and his wife took great joy in building their homes and gardens, and Sezimovo Usti seems to have been their favorite, a real home, a sanctuary, center of their social life, and their burial place. The couple met in Paris in 1905, became engaged a year later, and married in Prague in 1909. Hana Vickova brought a substantial dowry to the marriage which allowed Edvard to devote himself to his scientific and educational career. For enthusiastic Hana, Edvard was a lifelong advisor and teacher. For hard working and somewhat aloof Edvard, Hana, with her open personality, education and intelligence became the public face. World War I caused a major disruption in their lives, driving Edvard to go abroad along with Masaryk and Stefanik, where they could be better advocates for their Czechoslovak nationalist interests. Hana stayed home, but could not avoid imprisonment which undermined her health, and may have contributed to the couple’s remaining childless, making Hana more devoted than ever to creating homes for herself and Edvard. Following the war, with the creation of Czechoslovakia, their lives changed again when Edvard Benes became foreign minister, and eventually prime minister. However, life continued to be difficult. Benes resigned from the government in 1938 following the Munich agreement, and went into exile again in England in 1939. He returned following the war, and resumed his duties briefly before, sick and dying, he again resigned from the government (now Communist). Benes died and was buried at the villa in a place of his chosing. Hana survived him for another 26 years, living out her life at Sezimovov Usti, fighting off Communist confiscation of the villa as long as she could. In her will she wanted it opened to the public. Oddly, under Communism this was not possible, and it was only to be achieved after 1990. The villa was fully restored between 2006 and 2009. The house in Sezimovo Usti was originally the Benes’ summer home. It was designed in 1930 by architect Petr Kropacek, with participation by the owners whose image for it was of a villa in Southern France. This translated into smooth walls, low roofs, and light rooms. Being as far north as it is, it was necessary to take advantage of natural light wherever possible, with much glass. The exterior windows, as is standard practice in this climate, are installed on both surfaces of the thick walls, doubled for insulating purposes. They are casements which open in. Between rooms, this interesting detail was repeated with glass sheves as a borrow-light, adding reflective light to the composition. The gardens, in the English style, with large trees and pools, were designed by architect Otakar Fierlinger, who also designed a later addition to the house. The estate had been enlarged between 1932 and 1938 with gradual purchases of adjoining properties. This allowed both a formal “parterre” and a more relaxed park beyond it which led in each direction to the rivers bordering the property: The Luznice River to the South East, and Kozsky Creek on the opposite side. The contours of the site inspired a rock garden on the slope towards the river, and on the advice of the author Karel Capek, a well was placed below a spillway from the pool near the house. It was known as Karel's Well. The couple both loved to garden, and planted many of the trees themselves. The Fall colors during our visit are spectacular: the birches are an intense yellow, and the oaks in shades of variegated rust and gold. The vines on stone walls and buildings have turned an intense red. I enjoy the company, the day, and the insights into 20th Century Czech history.